Ross Taylor marked his 27th birthday with a spectacular century in Pallekele as New Zealand thrashed Pakistan by 110 runs to go top of World Cup Group A.
Taylor, missed twice early on by keeper Kamran Akmal, began slowly but launched seven late sixes in his 131 not out. In an amazing assault, the Kiwis hit 92 from the last four overs to post 302-7, with Taylor smashing 62 off 16 balls and Jacob Oram scoring 25 off nine. Pakistan lost four early wickets as they slumped to 192 all out. Seamer Tim Southee took 3-25, while Kyle Mills, Nathan McCullum and Scott Styris claimed two wickets apiece, and Abdul Razzaq top-scored with 62. The Kiwis' bowling effort was all the more impressive, given that captain and influential left-arm spinner Daniel Vettori could not bowl a single over after injuring his knee in the field. The victory lifted New Zealand to the top of the group and inflicted 1992 World Cup winners Pakistan's first defeat of the 2011 tournament. The Black Caps made a pedestrian start to their innings, reaching 99-2 at the halfway point, 163-4 after 40 overs, and 210-6 at the end of the 46th. 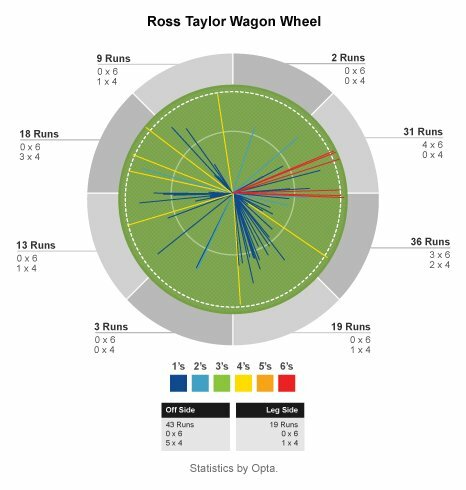 What happened next was one of the most extraordinary displays of power-hitting the one-day international game has seen as Taylor and Oram hammered 85 from 22 deliveries. 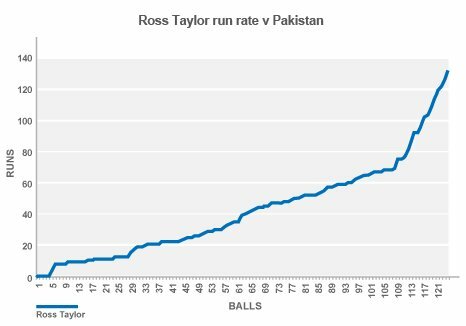 First, paceman Shoaib Akhtar - who could have dismissed the batsman on naught and eight when routine chances were inexplicably squandered by Kamran - was derailed in stunning fashion as Taylor plundered 26 runs from a single over. The fireworks continued as an Abdur Rehman over went for 15 before Taylor - dismissed for single figures in four of his previous five innings - helped himself to another three sixes and two fours from Razzaq. Oram holed out after smashing another two sixes from the first two balls of the last over, and Mills smacked seven off the final three balls to complete a breathless passage of play. "I had a bit of luck early on and even at 30 or 40 I struggled," said Taylor, who faced 124 balls in total for his fourth one-day century. "But Nathan McCullum and Jake Oram showed me the way to play, I backed myself and a few came out of the middle. "To have them six down so early was a credit to the bowlers. We didn't want to be complacent but we thought it was only a par total." Pakistan were all but shot to pieces inside the first eight overs of their reply as an excellent opening burst from seam duo Southee and Mills tore through their top order. Southee had Mohammad Hafeez leg-before in the second over, and Mills removed Ahmed Shehzad and Younus Khan in the space of four balls. Kamran failed to atone for his earlier blunders as he was caught at slip for eight, and Misbah-ul-Haq squirted a thick outside edge to Styris in the gully. Shahid Afridi briefly entertained the crowd with 17 from nine balls before he was clean bowled by Oram to leave Pakistan 66-6. Umar Akmal delayed the inevitable with a measured 38 and Razzaq became only the fourth player in history to pass 5,000 one-day international runs and take 250 wickets on his way to an admirable 62 off 72 balls. His high-tempo partnership of 66 with Umar Gul briefly raised the prospect of a fightback along the lines of Ireland's against England but all hope was extinguished when Razzaq skied a catch to Oram at long-off. Shoaib holed out three balls later as New Zealand rounded off victory in the 42nd over. Earlier, in the first one-day international to be played at the Pallekelle International Cricket Stadium in Kandy, big-hitting Brendon McCullum served notice of his potential by heaving a free hit for six in the first over after Shoaib had over-stepped. But from the next ball, Shoaib produced a delivery that nipped back off the seam and flattened McCullum's off stump. Jamie How, a late replacement for the unwell Jesse Ryder, batted with extraordinary caution in scoring four runs off 29 balls before he was trapped lbw by Gul. Shoaib's opening spell was a curious mix of balls the ripped off the seam, no balls and wides, with an unnecessary shy at the stumps which gifted New Zealand a boundary. And the veteran paceman's mood was not helped by an extraordinary over featuring two shocking errors from wicketkeeper Kamran. First, he allowed a Taylor edge to fly between himself and first slip, and two balls later, he put down a routine nick. Meanwhile, Martin Guptill continued his excellent start to the tournament, battling to 57 off 86 balls before he was bowled by a snorting delivery from Afridi that drifted in the air before straightening on the bounce and clattering into his middle and leg stumps. James Franklin was lbw to Mohammad Hafeez for one and Styris was dismissed in similar fashion for 28 by the outstanding Gul, who bowled Nathan McCullum for 19 to pick up his third wicket. That dismissal left New Zealand on 210-6 at the end of the 46th over, with the 250 mark appearing some way off. The fireworks that followed will live long in the memory of all who saw them.